I haven’t found many funny podcasts but I finally found one that’s making me laugh out loud. 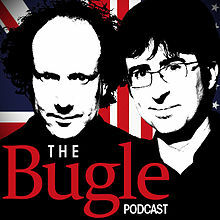 The Bugle describes itself as “one of the universe’s leading satirical podcasts” and after listening to one episode, I have to agree. On the show, John Oliver and Andy Zaltman (both have British accents and humour) discuss current affairs. The free podcast started in 2007 – how is it possible I only find out about it now? I just listened to episode 283 – #JeSuisCharlie – which, you guessed it is about the Charlie Hebdo attacks in Paris in January. Not a particularly funny topic. Yet, the show gave me good giggles. I should say I did not like the start though – for a few minutes the hosts just joked about playing football together which was neither particularly funny nor interesting. But once they started talking about the attacks, it was good fun. “One of the biggest question that people are trying to wrap their arms around is: Why. Why would people do this? Why would they kill innocent people over a cartoon? To which the answer is: Because they’re assholes. And that’s basically it. “It’s easy to overcomplicate a response to that question. I mean, to an extent people would then add their own beliefs or prejudice to the motivation. But if you really boil it down, the answer: ‘They’re assholes’ really gets to the nub of the question that you’re trying to ask. Ps: I HATED the Side Hustle Show. Might explain why later. I have to go pack for my holiday now. Might not be able to post for a couple of weeks, but I’ll try to. If you find any other funny podcasts, let me know!